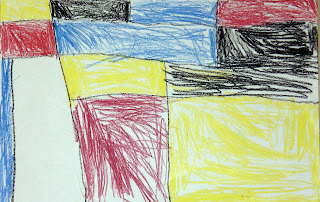 Kindergarten students learned about the art and life of Piet Mondrian for this project. They learned about vertical and horizontal lines, as well as the 3 primary colors. Students were able to decide how many lines they wanted to include on their project and how many boxes they wanted to color. The only requirement was that they had to leave at least 1 box white. Once they were done, students were able to title their piece.